Pork fillet and chicken breast meat may be used for low fat diets and cooking on a hot plate or grill. Tastier results, and caramelising, will occur if chicken thigh is and pork neck is used for cooking over charcoal. 1 small pork fillet and 2 skinless chicken breast (or thigh) pieces will make approx 12 skewers. Slice meat into ~10mm thick strips and marinate for at least 30 mins before threading onto pre-soaked (in water) bamboo skewers. 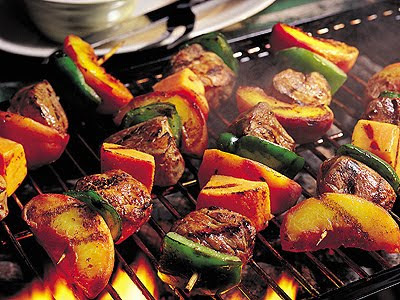 Marinade quantity and ingredients may be adjusted to taste. Thread meat pieces on bamboo skewers together with pieces of onion/peppers etc. NOTE: marinades may be used for chicken wings and other meats. 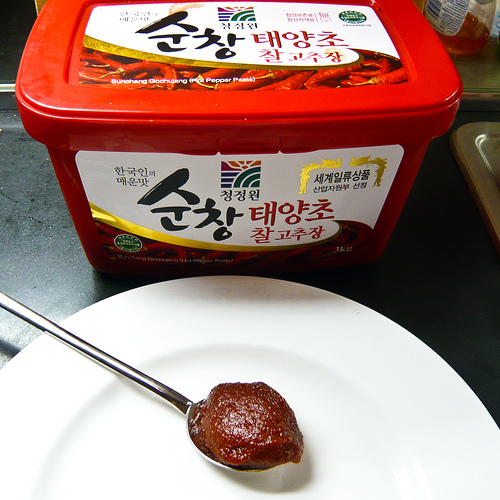 Gochujang Korean red chili paste is widely available and ideal for stir-fry, curries, and marinades. Fresh chopped turmeric (or a spoon of powder), a chopped stalk of lemongrass, and black peppercorns .... all pounded into a paste with the garlic, ginger and salt. Mix in with liquid ingredients and marinate for one hour or more. Cook pork chops fast over a high heat for best results with caramelisation of fat. We have an elderly relative living with us at present who's used to MSG in every meal. She remarked on how tasty Jo's cooking is (also despite using far less sugar than she likes) and was amazed to hear that we NEVER EVER use MSG. Dammmm just started dinner.....555 Rob have you cooked these yet? Vn style pork chops tonight I use lean (sow) chops with 90% of fat removed otherwise it just burns. You can use golden syrup in lieu of honey and/or a thick soy, eg Kejap Manis. Not too much liquid, just enough to make a marinade come paste. Experiment with quantities according to taste. I'm still working my way through the Chinese website you sent me. Had some good meals and the kids are loving it.